I work with many clients who struggle with anxiety and/or depression, typically related to their personal or professional lives. I also notice that sometimes it is with the client’s fears that increase their anxiety, which then seems to increase tendencies of self-sabotaging thoughts, actions, and behaviors. My job as their clinical therapist is to identify reasons/triggers causing those fears, and then to help them find coping strategies that work effectively for them. I recently read an article that touched on this very topic from FastCompany, “This is how you can get rid of your self-created failures” by author Ted Leonhart. Leonhart discusses a method that is very similar to Cognitive Behavioral Therapy (CBT) which I often use with my clients who are struggling with anxiety and/or depression. To summarize CBT to clients, I briefly explain to them that our thoughts create feelings, which creates emotions, which then can lead to anxiety and/or depression. 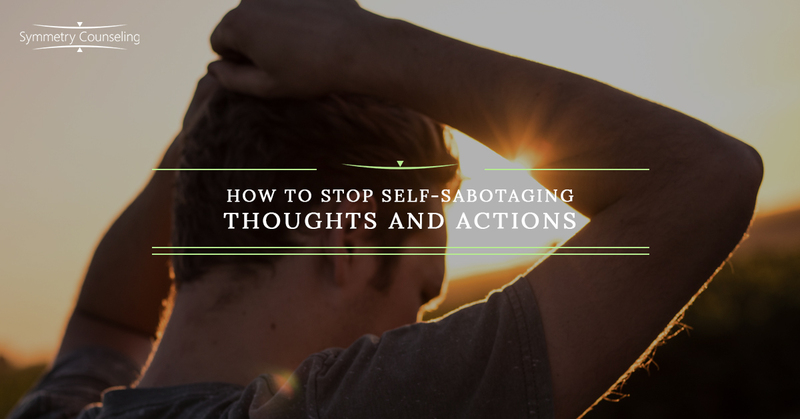 Below is simple guide Leonhart outlines on how to specifically stop those negative self-sabotaging thoughts! Tracking Thoughts. It is important to pay attention to what thoughts you are having throughout the day. Many times, it is negative thoughts that can lead to more anxious or depressing feelings. Without tracking these thoughts, we are left just feeling confused and frustrated about our anxiety and/or depression. Some individuals find it helpful to track their thoughts through journaling. Reframing Thought Patterns. If we go into a work meeting thinking, “this is going to be really bad; I will probably mess up my presentation,” it will most certainly set you up for some self-sabotaging and fear going into the meeting. Whereas changing that thought to, “I got this meeting! It’s okay if I do not know the answers to all of the questions. It is okay that I am feeling a little nervous, but I am confident and competent in my expertise” is definitely a better way to prepare for a meeting that may be causing some anxiety. Facing Fears. Fears can truly lead to these self-sabotaging words we say to ourselves. It can even feel physically paralyzing. Sometimes clients even feel their anxiety physically, whether it be sweaty palms, racing heart-beat, or even a headache. I do believe that through just sitting with these fears and understanding what meaning we attach to them, can help us overcome them. Some people attach meanings such as “I am a good employee or a bad employee based on this meeting”. I gently challenge clients to create new narratives of the way they are thinking. For example, just because you make a mistake, does not mean you’re a bad employee. It simply means there are new things to learn, and that is a great thing! Failure is Okay. Yes, everyone fails, and that is okay! Some people choose the thought pattern that if they fail at something, they are a failure. That is just not the case. In reality, failure is simply an opportunity to overcome something challenging. The most brilliant people in the world have certainly failed. It was likely with their failures, that they were able to find internal growth. So, if you are currently practicing some self-sabotaging fear-based thoughts, I encourage you to just reflect on that. Ask yourself, how is this self-sabotaging thought benefiting me? Likely these thoughts are needing some reframing to better benefit your emotional well-being. If you are currently struggling with self-sabotaging thoughts that is leading into some anxiety, it may be a good idea to connect with one of our skilled counselors at Symmetry Counseling today. You can contact them at 312-578-9990 to set up an appointment.